Last week, while I was busy in Berlin with an interactive installation, I received some good news: Skeltrack got an award in an innovation contest organized by the KNetworks project. Members of KNetworks include several universities and government organizations of the European countries in the Atlantic area. Being the first Open Source library for skeleton tracking, there are a number of possibilities that Skeltrack makes possible and we developed it in Igalia simply because we wanted to use skeleton tracking and there were no open solutions available. So I am very happy with the recognition, in this case a joint 3rd place. Since there was a ceremony in Oxford for the delivery of the awards, I bought a shirt in Berlin 🙂 and flew to London instead of Coruña. I presented Skeltrack and also mentioned Igalia and the cool things that make us different. After that we ended up in the Turf Tavern — the oldest pub of Oxford — where I discovered that I completely dislike ale. 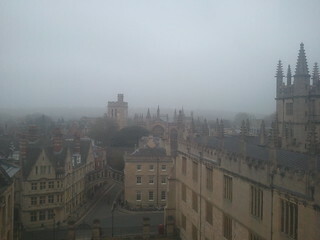 I had never been to Oxford before so I stayed an extra night to visit the city. What a nice city it is! It is kind of similar to Évora, where I studied, in the way that it has many university buildings spread across the city but of course, at a different scale. On my way back to Heathrow, more awesome stuff: I found out that the old man sitting close to me in the bus was in fact Donald Knuth! I presented myself, chitchatted a bit and, feeling like a little boy who met Spiderman, thanked him for everything. I would like to thank the organization of the KNetworks contest for the award and congratulate the other contest winners.